Goal: Use a children’s illustrator as an inspiration. Practice working with this artist’s idiom. Write the story of your characters. Action: Create a character that mimics their work. Two very large and very delicate greyhounds have been rescued from a life on a racetrack in Texas. This old life consisted of many many greyhounds living together. 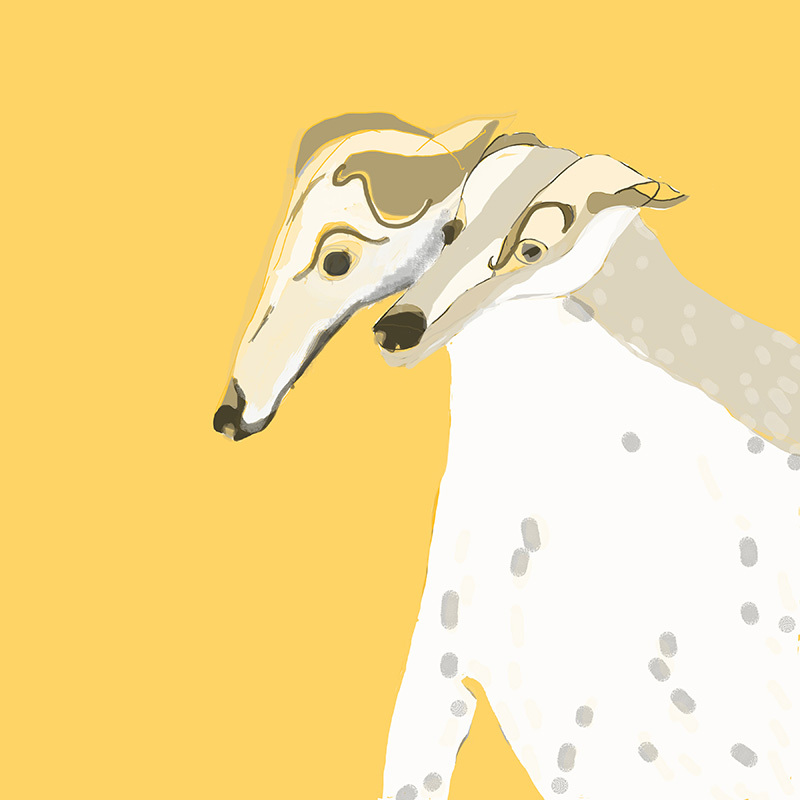 Greyhounds together are chaotic, tiring, and communal. This life had its ups and downs all roped around a tight routine: 5 meals a day, naps in between, intense daily physical racing. This community of greys lived off the track in a giant room full of individual cages, stacked two high, and running the length of a warehouse. These cages were spartan and empty of toys and pets, but within these cages, they came each grey’s absolute personal privacy. Now, they have come to live in a new home. This home has things these greyhounds have never had before-wonderful things like savory treats such as ham slices, sofas for marathon napping, and keepers who direct sweet, soothing noises at them. These new things are luxurious! There are many new things that are not so luxurious, new, overwhelming and amorphic things that appear loud and chaotic and utterly terrifying! Wednesday mornings are garbage days where garbage trucks roll outside the house and clang and grumble and make noise. SCARY. Thunder storms are VERY SCARY but more rare. The most persistent and frightening element of this new life are the stairs.